Q: What happened after they left MGM? A: Jeanette finished out her MGM contract with a witty but low-budget film, CAIRO. Robert Young co-starred and Woody directed. 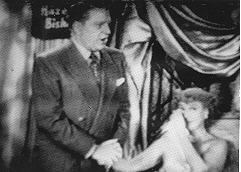 Nelson made PHANTOM OF THE OPERA at Universal in 1943 and planned for Jeanette to join him there for a second movie. (Jeanette did film a cameo as herself in a Universal film released the following year, FOLLOW THE BOYS.) That film never materialized because after Woody Van Dyke died, in February, 1943, Nelson agreed to work for the OSS and was sent over to the Middle East late that year on a “singing tour” while also doing undercover work. Jeanette couldn’t get medical clearance to go overseas — she already had a bad heart — but toured the US, auctioning off encores at her concerts to raise money for the Army Relief Fund. She received a medal from FDR for raising more than any single performer. She also made her opera debut. She and Nelson enjoyed some degree of stability in their relationship during these years. 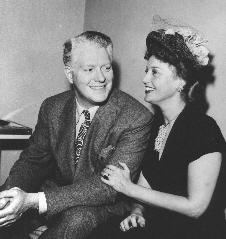 They appeared often together on radio during the 1940s, and the contemporary written observations by the fans — even those skeptical of a relationship between them — were very telling. 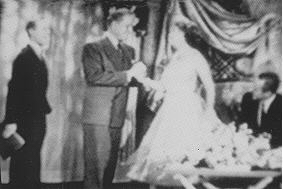 From another report from one who attended nearly all of Nelson’s weekly broadcasts, September 16, 1948: “Somehow Nelson seems to feel more at ease when working with Jeanette than any other co-star and she seems to inspire in him a degree of self-confidence that he never possesses when working alone or with others.” Below, holding hands together on-air. 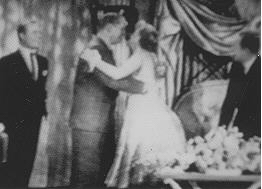 From a March 26, 1946 radio show: “[After the broadcast] Nelson wanted to kiss Jeanette, he just grabbed her in his arms and tried to kiss her but she kept pulling back and pushing on his ‘manly chest’ for all she was worth. He kept trying to drag her out in front of the rapidly closing curtains and I heard him say something about wanting to kiss her out in front of the curtains, but she just kept wrestling with him until he finally had to let her go.” Below, his arm around her. Nelson filmed a mediocre version of KNICKERBOCKER HOLIDAY in 1944, did all the voices for Disney’s “Willie the Operatic Whale” segment in MAKE MINE MUSIC and then signed with Republic to make NORTHWEST OUTPOST in 1946. Jeanette was supposed to make the film with him but backed out when she became pregnant. Angry that he could not or would not get a divorce from Ann, Jeanette didn’t tell him about her pregnancy and opted instead to do a concert tour in the United Kingdom. She may have planned to have the child there, away from the chaos at home. Nelson was furious that she had backed out for no apparent reason. Jeanette lost the child soon after arriving in England. The first few concerts on her tour had to be postponed while she was in the hospital, and were rescheduled at the end of her tour. 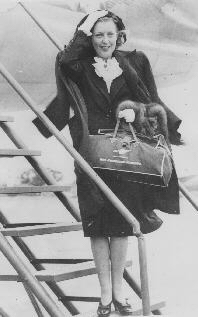 Below, her arrival in the UK in June, 1946, suffering from air sickness and morning sickness. When Jeanette finally returned home and briefed Nelson about the pregnancy and its outcome, he suffered a breakdown. He had given no concert tours since the war and was now ready to give up singing altogether. Jeanette pulled him out of that crisis; earlier in the year she’d literally held his hand through a night-long coma in which he nearly died from pneumonia. 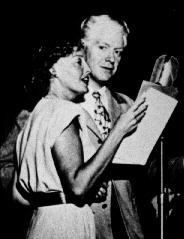 She also rekindled his desire to sing and he finally decided to begin touring again in March, 1948. NORTHWEST OUTPOST was Nelson’s last film. Jeanette returned to MGM to play mother roles in two films, THREE DARING DAUGHTERS and THE SUN COMES UP, a Lassie movie. Then she bowed out of films. 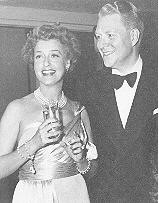 They had hoped to return to MGM together, or produce their own films, but the stress of their personal problems undermined any movie projects and nothing materialized. 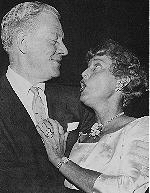 Q: If they loved each other, why didn’t they get divorces in the late 1940s, when the film careers were over? A: We don’t know all the answers. What we do know is that Nelson was under the impression (it seems from his lawyers) that he could not initiate the divorce. Ann Eddy was apparently was seeing psychiatrists who were prepared to argue on her behalf if Nelson tried to take her to court. In 1945 a local paper ran a blurb reporting that they had separated and Ann apparently agreed to divorce him, but the terms were unacceptable to him — she would clean him out financially and expose his affair with Jeanette. 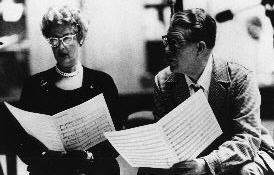 In a 1945 letter, it states that “Jeanette recently settled a lot of money on Gene so he doesn’t have to work ever again if he doesn’t want to.” It seems Gene was never the problem in this regard. Jeanette’s health began to fail in the mid 1940s. She had two heart attacks that we know about, one around 1944 and the other while she was making THE SUN COMES UP in 1948. She also became obsessed with having Nelson’s child before she was too old. Despite the 1946 miscarriage she was pregnant again in the fall of 1947 at age 44, but lost the baby the week before Christmas. Below, another radio show. Jeanette is wearing the engagement ring Nelson gave her in 1935. 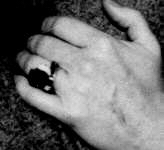 Note on the close-up of her hand the swollen and bruised vein. She was hospitalized a few times during these years and may have recently had an IV that caused the bruising. She also has a bruise on her arm. Q: Why did they break up in the late ’40s? A: Although Jeanette appeared to be the stronger one emotionally in the ’40s, their circumstances battered her down. Added to this, Nelson was freaked out by her doctor’s warning that another pregnancy could kill her, especially since she was determined to go ahead and have a baby anyway. Nelson’s “solutions” weren’t too successful; he tried first putting their relationship on a “spiritual” level, he tried to be celibate, he then broke up with her briefly; when that didn’t work, he got back together with her but they went through long stretches of sporadic intimacy while he sought relief elsewhere. Even the contemporary letters from his groupies mention with disdain his habit of picking up girls from his radio show — and elsewhere — during this period. In his mind, this was how he had to live to keep her alive — and he turned to various New Age religions for spiritual answers. For Jeanette, the situation was pure insanity. One of Isabel’s friends wrote, “It’s surprising to know what a wild history Nelson has at this point, and what a terribly difficult time Jeanette is having with him.” The relationship eroded until she felt there would never be a happy ending for them. She broke up with him and right after suffered a breakdown. We don’t know the exact date but it appears to have occurred around mid 1949-50. A: This TV show premiered on the air in September, 1952. In November, Jeanette was a guest star. 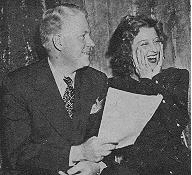 Nelson had been approached to be one of the people from her “song-filled life” to join in the surprise. He refused to show up and it wasn’t until Blossom met with him that he changed his mind. Nelson and Jeanette had been separated for about three years. In that time Nelson had seen his career fall apart: radio was dead, concerts were dying out and he couldn’t seem to find a place for himself in the new medium of television. He was floundering, as was Jeanette. 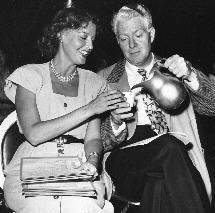 She had worked sporadically, including in a play, THE GUARDSMAN, with Gene as her co-star, during 1950 and into 1951. After touring she’d hoped to take it to Broadway but the play wasn’t successful. At the time of “This Is Your Life” she was attempting another concert tour. Nelson had never known of Jeanette’s breakdown or fully why she left him. With Blossom filling in some of the details his attitude softened and he agreed that it would be humiliating to Jeanette if he didn’t make an appearance. The night before the show, Jeanette gave a Los Angeles concert. Nelson attended without alerting her and sat in the back as inconspicuously as possible, though some fans recognized him. He left immediately after the concert and didn’t go backstage. Who knows why he was there… maybe to settle in his own mind that he was doing the right thing by allowing her back into his life — as he no doubt knew was inevitable. “This is Your Life” was filmed live at the El Capitan Theater in Hollywood. Jeanette had never heard of the show and was only told she was to award a plaque to Ralph Edwards. She was genuinely surprised and a little uneasy to learn she was the subject of the TV show. The minute Edwards mentioned her movies with Nelson, she looked worried, fearing the worst. 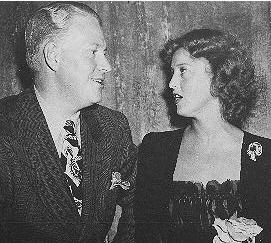 (While parking her car, her driver had been told to park “right there next to Nelson Eddy’s.”) Every time Edwards mentioned Nelson or another “old friend” she caught her breath and looked nervous, or her head went down. “This Is Your Life” captures, in a live half-hour show, more about Jeanette’s life, her relationship with Nelson and Gene than any single interview ever given. If you haven’t seen it, you should. In it we watch her reactions and impulses as she struggles to get through gracefully what was evidently an emotional ordeal for her. Gene, of course, is backstage and when he makes his entrance they hug. She wags her finger at him: “You lied to me.” They sit on the couch, though not close together. At one point she leans back against the couch where his hand is resting, he moves it away and doesn’t touch her. …And takes her hand while she tries to compose herself. When he finishes the song she bolts up from her seat and for a moment it looks like they will kiss, but instead she melts into his arms for a hug. The difference between this body language and the hug she gave her husband is most telling. Nelson and Jeanette did reconcile after this show, but it was some time before their relationship returned to some semblance of what it had been before. Nelson was afraid of being hurt again, so it took time, persistence and patience on her part to win him back. Q: Why did Nelson do nightclubs in the 1950s? Why didn’t he go back to opera? A: He didn’t think he was a good enough singer, which shows you how low his self-esteem really was. Several of his peers, including Rise Stevens, suggested it to him and were disappointed when he showed no interest. Nelson later claimed in an interview that he and Jeanette were sitting around at the piano and that’s where he got the idea to do nightclubs. 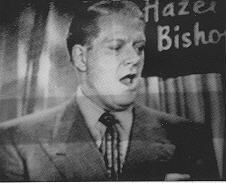 He certainly showed a new enthusiasm for his career by early 1953 — just weeks after the “This Is Your Life” telecast. His act was a success and he began a whole new life. Jeanette made a couple of stabs at doing her own nightclub act but ultimately gave it up. She didn’t like the nightclub atmosphere, where people talked, drank and smoked during the performance. Nor was she physically up to the strenuous pace. Her first cousin Esther remembered Jeanette staggering back into her dressing room after a Las Vegas performance, collapsing in a chair, her arms flung out, her head falling back limply, gasping for breath. Nelson was crushed that Jeanette wouldn’t sing with him. If she had, the 1950s might have been very different for them. He also tried, in 1953, to get her to agree to tour Australia with him. She, meanwhile, was trying to set up a movie for them to do. When these plans all fell through, there was bitterness on both sides. 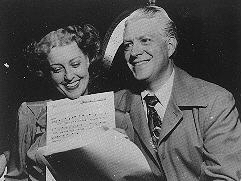 Nelson needed a singing partner; he hired a young blond named Gale Sherwood to tour with him. It was supposed to be temporary but she was good for the act and when time passed and Jeanette still refused to join him, Gale stayed on. This was a further sore point for Jeanette as Nelson and Gale were on the road together most months of the year. Around 1956, the relationship shifted again. Jeanette showed up at some of Nelson’s performances, like in the old days. He showed up at her summer stock production in Kansas City of THE KING AND I. They made their first TV appearance together on a variety show. 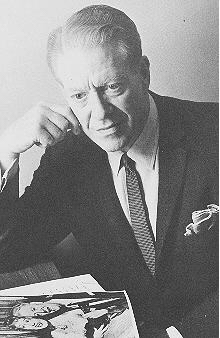 Nelson wrote a few movie or TV movie treatments for himself and Jeanette, that he tried to get produced. The following year, they began work on new RCA album, the first time they’d recorded together professionally in almost two decades. And then finally Jeanette pulled off a miracle. She got all parties to agree to a divorce. After all these years, Ann finally agreed. A meeting was set up with the lawyers. But at the last minute, Nelson refused to Ann’s terms. She would “clean him out” as she’d always threatened. He felt he was too old to make his fortune back. The old bitterness surfacing, he reminded Jeanette she should have married him when he first asked her all those years ago. As far as he was concerned, they could continue as they had for years. He walked out of the lawyer’s office leaving her in tears. The divorce fiasco was almost the last straw for Jeanette. Her health crashed again; in early 1959 she cancelled a series of concerts, did one last professional performance in a stage production of BITTERSWEET and then retired for good. Q: What happened in the 1960s? A: As expected, they had a reconciliation of sorts — they were never able to cut the umbilical cord. Nelson was on the road most of the year; Jeanette battled a failing heart. They talked frequently by phone, even daily at times, and he visited her when he was home. If anyone questions how they still felt about each other, the picture below tells it all. Even in old age, he gazes at her with the same adoration he’d always had. To him, she was always young and beautiful. Nelson was in Anaheim, California, on January 14th, 1965, preparing to open his show the following evening when the dreaded phone call came, telling that she had died. Jeanette was 61. Below, Nelson faces the press after her death. As he said, “They found me and I was crying.” Click here to hear an excerpt from the interview in which he broke down. Jeanette’s funeral, on the 18th, was “a circus,” according to Nelson. Thousands of fans mourned, Jeanette’s singing voice was piped through loudspeakers. 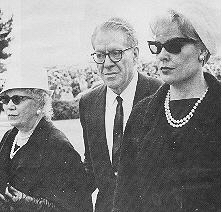 Below, Nelson at the funeral, flanked by his wife and Gale Sherwood. Behind them, a sea of ever-loyal fans. On March 5, 1967, Nelson gave an interview in Miami, Florida, where he was performing that night. He said that he intended to sing until he dropped. That night, he did just that. He suffered a stroke onstage, mid-song, collapsed and was rushed to the hospital, where he died the next morning. He was 65. You have just read the “lite” version of this Interactive Biography. The full version comes on a CD-ROM, has more information, high resolution photos, large photos for each thumbnail photo and more. Click here to get the complete Interactive Biography.